The Western prairie fringed orchid is a federally listed species. Its range is limited to prairie in Manitoba, Minnesota, North Dakota, Iowa, and Nebraska. In Northwestern Minnesota it grows in wet brush prairie. The Echinacea Project helps monitor orchids near Crookston, MN. Gretel works with The Nature Conservancy studying the effects of haying and burning on the orchid. Reproduces only by seed. Seeds are dust-like and wind dispersed. Specialized pollination. Pollinated at night by long-tongued hawkmoths. Flowering phenology. Peak flowering usually occurs in early to mid-July. 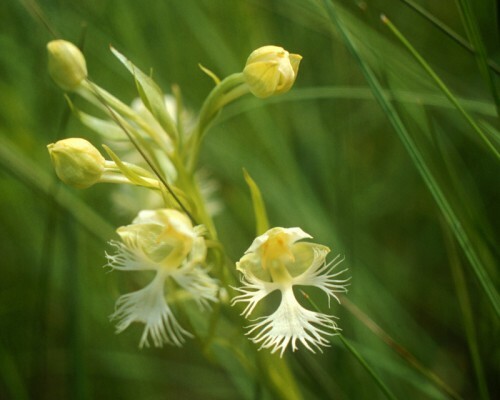 The USDA plants profile page for Platanthera praeclara. Center for Plant Conservation plant profile page for Platanthera praeclara.